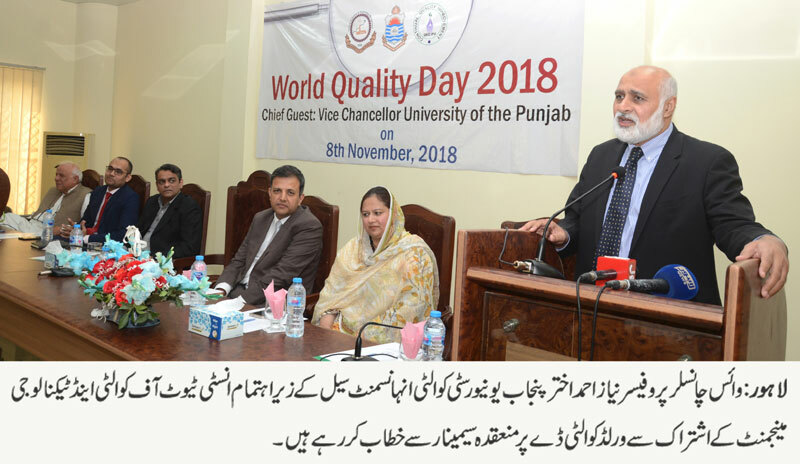 LAHORE: (Thursday, November 8, 2018): Punjab University Vice Chancellor Prof Niaz Ahmad has said that the nations and institutions who compromise over quality are replaced and we could not survive at international level without ensuring quality in all sectors. He was addressing a seminar on world quality day organized by Institute of Quality and Technology Management at its seminar hall here on Thursday. Institute of Quality and Technology Management’s Director Dr Usman Awan, former professor of the institute Dr Nasir, Ahmed Umair, faculty members and a large number of students were present on the occasion. Addressing the ceremony, the VC said that we must ensure quality of services in services sector and quality of product in manufacturing sector. He said that he established IQTM with the vision to improve quality in services and manufacturing sectors and it was the pioneer and No 1 institution in Pakistan. He said that the administration was focusing on producing quality graduates because now the competition had gone international, not national. He said that the administration was making efforts to restore academic excellence of PU. He said that all the universities in Pakistan were progressing and PU had also made 39 times improvement in Asian ranking of the universities. Addressing the ceremony, Dr Usman Awan said that the administration was making full efforts to bring PU amongst top 500 universities of the world and hopefully we would be in top 100 Asian universities next year. He said that IQTM was making efforts to make its industrial engineering program No 1 in the country. Prof Nasir said that it was not an easy job to promote research culture however it was a must to achieve quality and meet high academic standards. Later, souvenirs were distributed among the participants.